BASF Canada recently announced that it has received Pest Management Regulatory Agency (PMRA) registration for its Caramba fungicide for use on wheat, oats, barley and rye. The triazole fungicide provides protection against Fusarium head blight and provides leaf disease control, says the company. The active ingredient metconazole, from the triazole (Group 3) family of fungicides is claimed to have protective and curative activity on a number of foliar diseases in a range of crops. 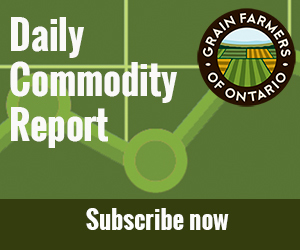 As it is recommended that Caramba is applied at 20 percent flowering for wheat, oats and rye, the product will not be available in Ontario or Quebec until 2011. Staff at Pioneer Hi-Bred in Chatham recently moved into the expanded facilities at their location. The company has doubled the size of its seed quality lab as a result of significant growth in the canola business, says president of Pioneer Hi-Bred, Ian Grant. The company recently announced the upcoming release of a new broad-spectrum pest-control trait that protects corn from black cutworm, Western bean cutworm, corn earworm, stalk borer, sugarcane borer and fall armyworm. According to Syngenta infestations of these pests, often known as lepidopteran corn pests, can cause more than $1.1 billion in annual losses in yield and grain quality in North America. AgriSure Viptera is a built-in trait that offers season-long protection from all of them, claims the company. They say that when stacked with Agrisure 3000GT triple stack, Agrisure Viptera will offer in-seed protection against the aforementioned pests, corn borer and rootworm along with providing tolerance to glyphosate and glufosinate herbicides.